Marimekko’s Siirtolapuutarha tea towel features Maija Louekari’s cheerful pattern that depicts beautiful summer flowers growing in allotment gardens. 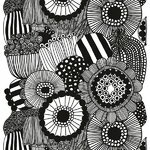 The monochrome fabric is made of 100% heavyweight cotton, and its repeat measures 98 cm. This fabric is sold by the meter. Finnish print designer Maija Louekari (b. 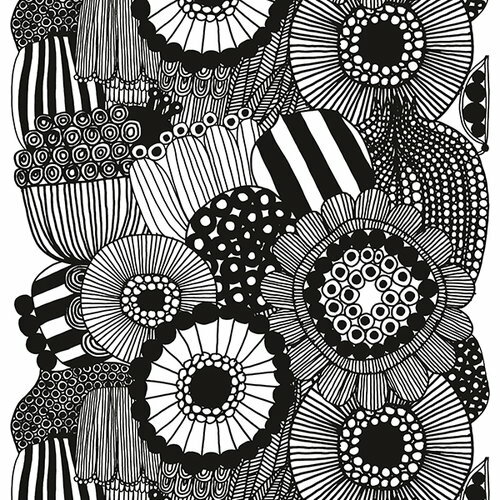 1982) is well-known especially for the textile prints designed for Marimekko. Louekari has studied at the University of Art and Design Helsinki, and in 2003 she won a design competition organized jointly by her university and Marimekko. She has worked as a freelance designer for Marimekko ever since. Louekari finds inspiration for her patterns from everyday life and the small things, people and sounds that surround her. Also different environments from urban metropolises to Finnish forests contribute to her work. Most of Louekari’s large, uniform patterns have been hand-drawn, and she also likes to experiment with different techniques such as paper cutting. Among her most important works are the Siirtolapuutarha and Räsymatto patterns, originally designed for Marimekko's Oiva tableware range in 2009.